This is a Less is More card with a heart cut out in the front and made using the colors of Red, Pink, and White. I used a white card stock as the base and cut out a Scalloped Heart Frame of Red Card stock with Nesties Scallop Heart dies on the front and stamped a heart on the inside of the card with Flourishes "From the Heart" stamp in Memento Rhubarb Stalk ink. I filled in the design with Memento Angel Pink Marker. I stamped the banner with sentiment from the same stamp set and inks. I embossed the top of the front with Cuttlebug EF With Love EF. 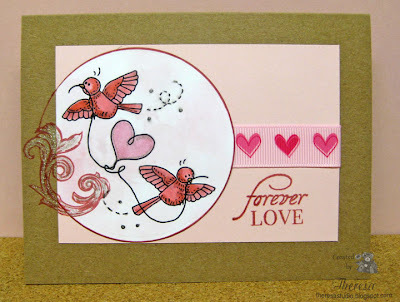 I also used other stamps from Flourishes from the same set and "Love Sweet Love" stamp set on the inside. Papers are from my paper stash. Just Us Girls: Color challenge-Use red, pink, and white. 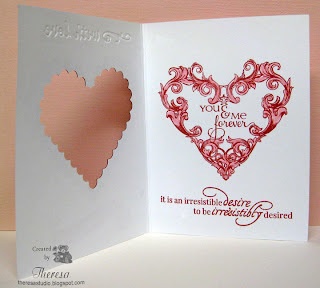 Less is More Challenge: Theme is Cut It Out-use some kind of hole or aperture in your card! Happy Australia Day to my friends in Australia! What a gloomy, cloudy, and cold day in Ohio! Thought these colors might brighten up the day! 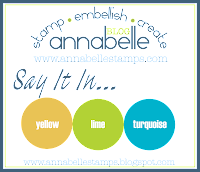 Annabelle Stamps Blog has a color challenge this week and it's a bright and fun combo of yellow, lime, and turquoise. I stamped this whimsical flower with Bamboo Leaves ink on white CS from the Annabelle's set Whimsey Flowers. I colored it with Copics G20,G21, Y02, Y06, and Y11 and trimmed and matted the image on an embossed mat of Lime Green CS and Yellow CS. Placed this on an embossed White CS and attached to the card base of Turquoise CS. 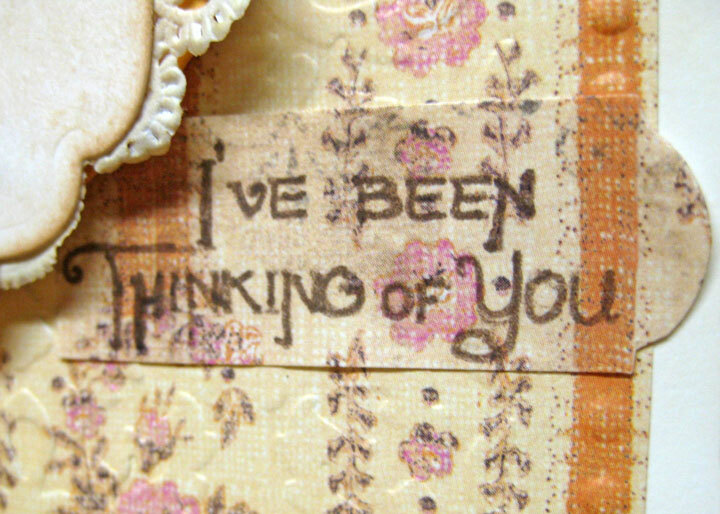 Finished with a ribbon from stash and a sentiment from Annabelle's Dotted Flowers set. Added some Yellow Glitter Domes from my stash. All CS was from my stash and used Cuttlebug EF Swiss Dots and Divine Swirls. The day seems brighter but the clouds are still outside. 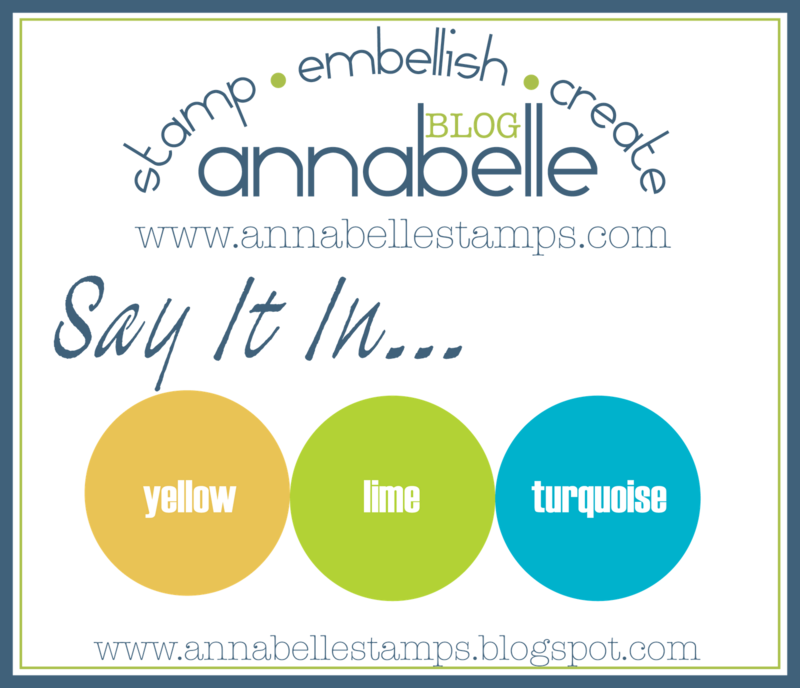 Annabelle Stamps Blog: Say it in yellow, lime, and turquoise. One Stop Craft Challenge: Theme is under the weather. Cards can be either weather related or get well soon. Hope your day is bright and cheerful. You brighten mine with your visits and comments. Good Morning. Today I am showing a simple card for Valentine's made with a digital image "Love Strung Birds" by Meljen's Designs. 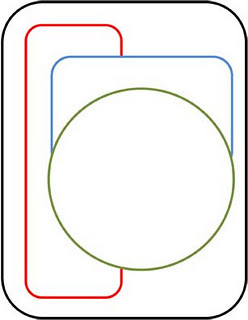 I cut the image with a circle die and colored with Copics and edged with a red marker. 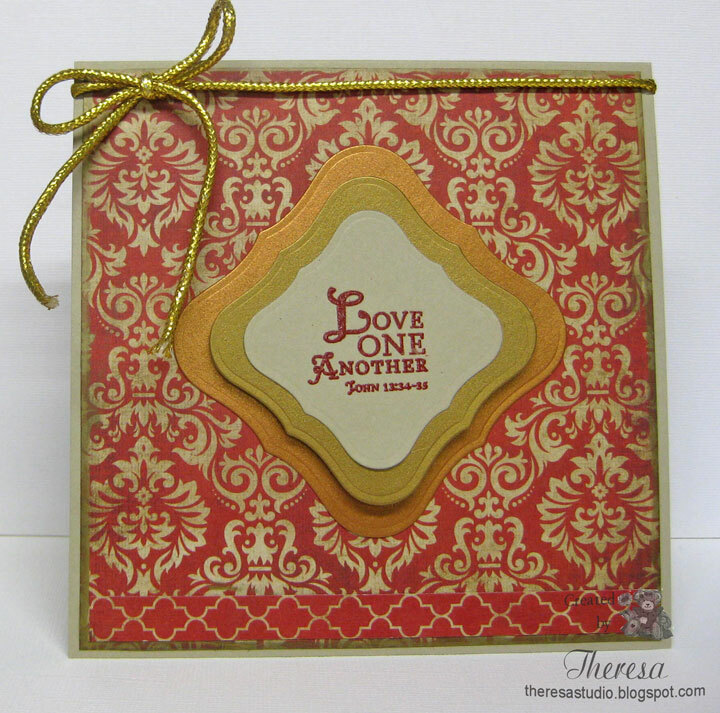 Using a sketch from Tuesday Morning, I assembled the card on Kraft CS layered with a Pink CS Mat and heart ribbon and stamped a flourish and sentiment from Flourishes. Added some sparkle with Clear Star pen. Keeping this post short and sweet. 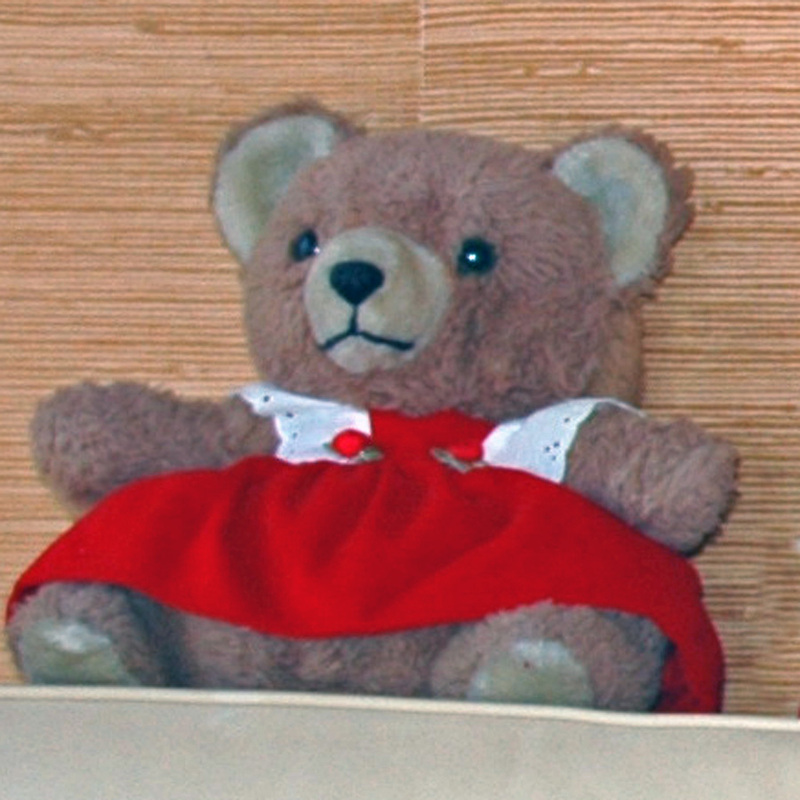 Meljen's Designs: Color challenge is Red and/or Pink and Kraft. Tuesday Morning Sketches: Sketch #130 shown above. Stamp, Scrap & Doodle: Challenge is Have a Heart. Cupcraft Craft Challenge: All you need is love. 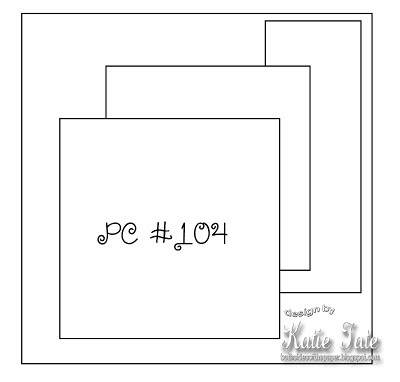 Supplies: Stamps-Meljen's Designs Digi "Love Strung Birds", Flourishes "From the Heart"
At The Pixie Cottage you can choose either a sketch shown on the left or the theme of embossing or combine both for their challenge. I decided to do both using The Pixie Cottage Stamp "Hannah at a Fence". I colored her with Copics and placed the image on a mat of embossed paper and then onto a strip of pattern paper. 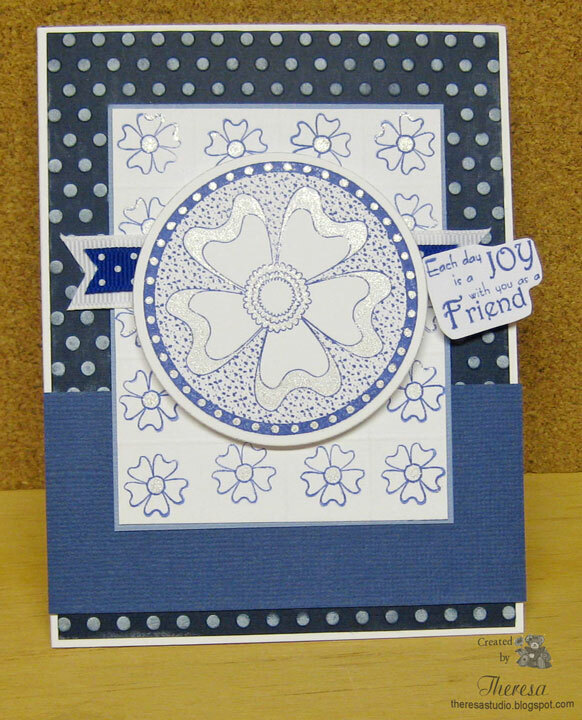 This I adhered to the card base of Slate Blue which I embossed on the side with a border of flowers and colored the raised area. 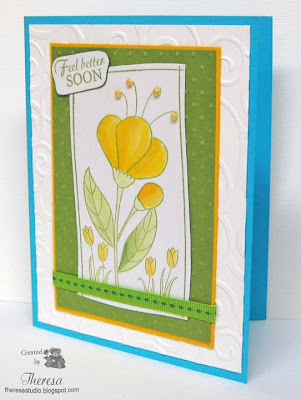 I added some dewdrops to the center of the flowers and added a sentiment stamped on a cut out . 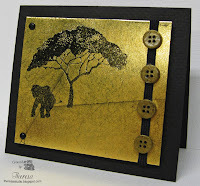 Challenge Link: The Pixie Cottage: Sketch and Embossing. Hello. I have just returned from a trip to Tennessee to be with my Mother for her 92nd birthday. We all had a great time visiting and celebrating. She is full of life and in good health and keeps us laughing with tales of her life ....she remembers everyone she meets and knows everyone's history including everything about everyone's life. I have rushed to get an entry in for Timeless Tuesday's challenge to make make anything but a card, something like a treat box or bag or even a tag. Since the Flourishes January Stamp Sets release was waiting in the mail for me last night (I still cannot believe I won it in last week's challenge and that it arrived so quickly), I decided to use one of these beautiful sets. I chose "From the Heart" stamps to create a box that I will fill with candy for someone...wonder who??? Made my box with White CS for the lid and Red CS for the bottom. 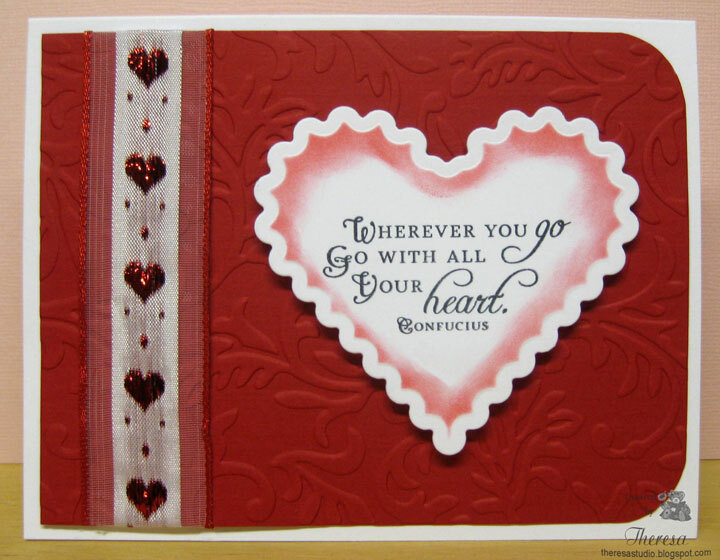 I added a border of hearts using an EK Border Punch from the Red CS. I stamped a flourish and sentiment on the lid with Memento Rhubarb Stalk. 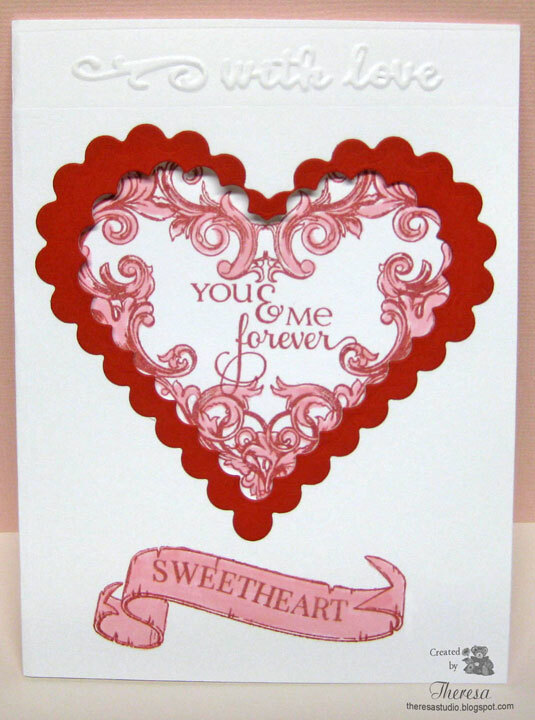 Used the same ink to stamp the lovely ornate heart and the banner and sentiment which is popped up on the heart. Attached this to a red scalloped heart cut out with a Spellbinder die and attached this to a band of Heart Ribbon from my stash. Now to find some candy. 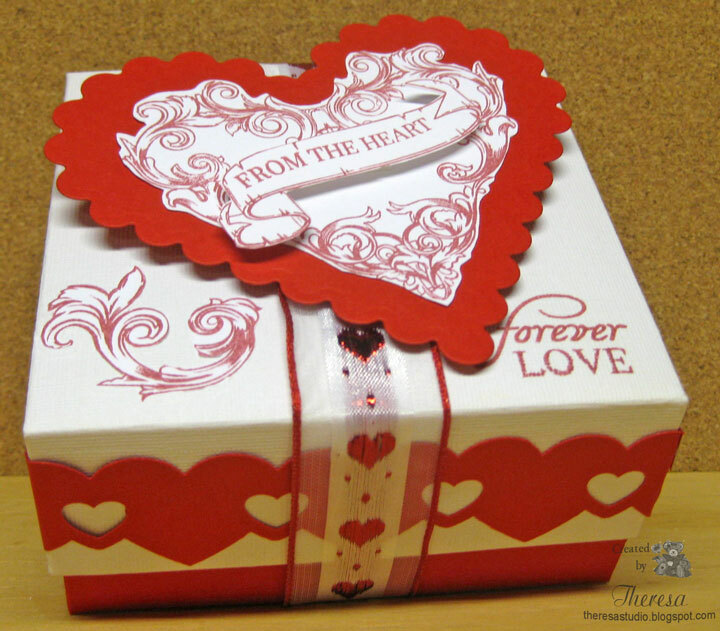 Timeless Tuesday #152: Heather asked us to make anything but a card, something like a treat box or bag or even a tag to hold some yummy Valentine candy or chocolates! Cupcake Craft Challenge: All you need is love. 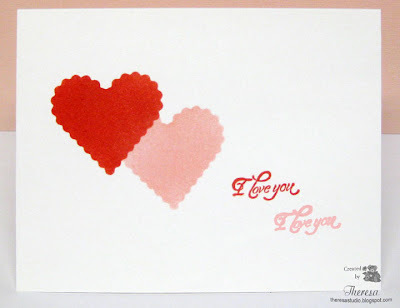 TSG 140: Love is in the air....use hearts and love in a project. This is a somewhat geometric card...something different from most of my designs. I was trying to incorporate blues, a sketch, ribbon, and spots and also ended up making my own backgrounds and used some stamps from Annabelle Stamps. I threw in some glitter by using Sakura Clear Star pen. This card fits several challenges. 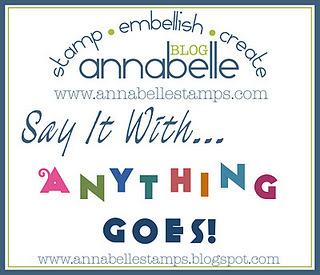 Annabelle Stamps Blog: Challenge is Anything Goes. 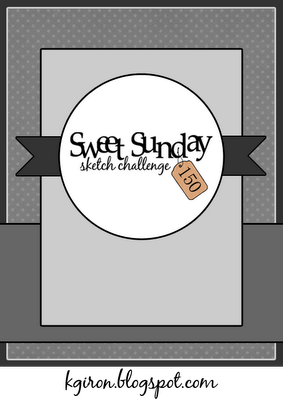 Sweet Sunday: Sketch Challenge #150 see below. Crazy 4 Challenges: Monochromatic card in the blues. One Stop Craft Challenges: The challenge this week is to include Spots and Ribbon. One of my ribbons even has spots. Secret Crafter Saturday Challenge: Anything goes with Blue. Second post today and maybe more to come. I was playing with some new paper and my new Grand Big Scallop dies and came up with this card featuring a Meljen's Design which was one of her Freebie Designs. He is such a cute bear with the big bouquet. He is saying Thank You to all who drop by this blog and leave a comment. Stamp: Meljens Digital Image Freebie "Thank You Bear"
The challenge at Speedy Fox and Friends Challenge for Week 90 suggested by Brenda is to use a border punch. I pulled out the Martha Stewart Double Loop punch and created this card using the "Peaceful Nuthatch" stamp set from Mark's Finest Papers. The nuthatch stamp is so much fun to color with Copics and I used my trusty bird book as a color guide. 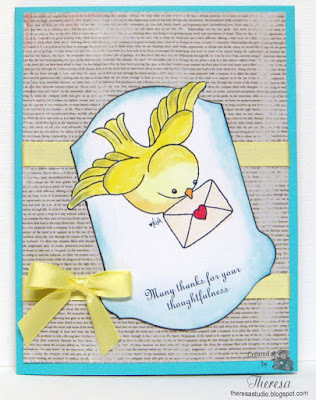 I used a neutral background to highlight the beautiful bird and used the layout from the Card Patterns Sketch 148. I finished with a twig of artificial evergreen snipped from a Christmas swag. Scrap-Creations: Use diecuts. Used circle and scallop circle dies. 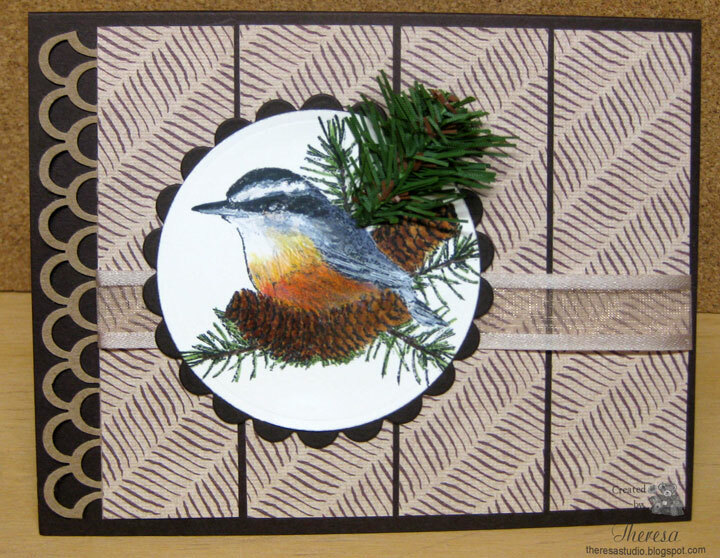 Stamp: Mark's Finest Papers "Peaceful Nuthatch"
Welcome! 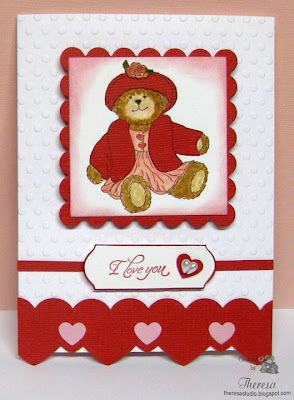 If you have visited here before, you know that I love Teddy Bears and making cards with them. 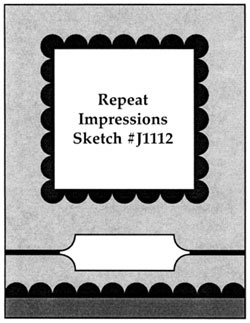 I am sharing a new stamp "Belle" which I won from Repeat Impressions. 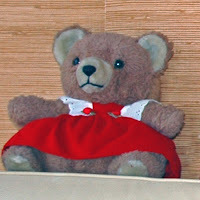 Doesn't she look like one of my fave bears "Beddy" shown in the photo below? I just had to have the stamp when I saw it. I made this Valentine for the Sketch Challenge at Repeat Impressions. I stamped "Belle" and colored her with Copics and then stamped her again on Red Texture CS to paper piece her hat and coat. Also stamped, colored and cut the flower to pop on to her hat. Added some glossy accents to the flowers and her heart buttons. The card pretty much speaks on it own. 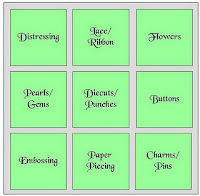 Our Creative Corner: Use some kind of paper piecing on your card . In addition NO ribbon and only one embellishment is allowed. Used tear pearls and paper piecing.﻿﻿﻿﻿ The stripe under the sentiment is paper not ribbon. 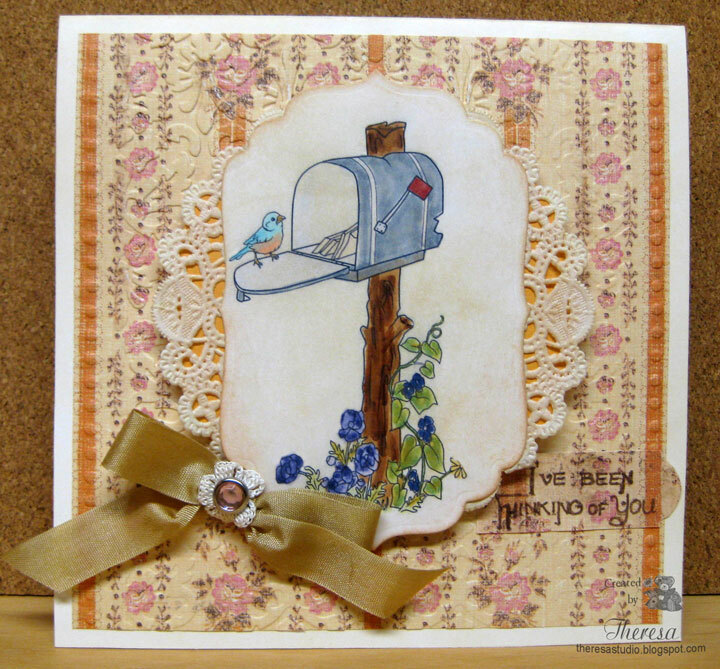 Stamptacular Sunday Challenge: Create a card or project that has at least two different textures on it. Have textures of embossing , pearls, glossy accents, and texture card stock. Let's Ink It Up: Anything Goes...only 2 entries allowed. This is my second. 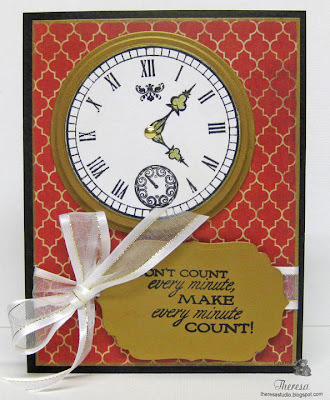 Mark's Finest Papers : Speedy Fox and Friends Challenge Week 90 Use Border punch. It has been so long since I did a One-Layer Card for a challenge! I was playing last night and decided to do one for Simplicity One-Layer Wednesday challenge to use red and pink...and ONLY red and pink...on a white card base. Since I had this Scallop Heart die on my desk I used it to punch a template and just sponged some Ranger Distress Ink Barn Door and Spun Sugar on a White CS . Then I stamped the GKD Sentiment from "Fanciful Tags" at an angle on the side. That was quick. Cherry Blossoms are so beautiful and remind me of spring time...nice to think about on a cold Ohio day. I stamped this image on white card stock and colored with Copics and matted on a lovely green mat. 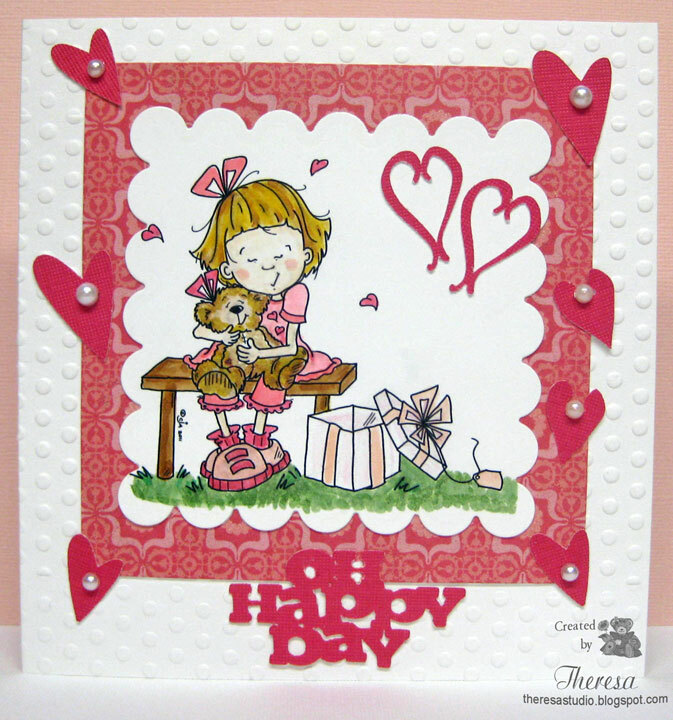 Followed a sketch to assemble with Pink card base and an embossed mat of White finished with scalloped half circles. This will be a birthday card to send this spring. Timeless Tuesday Challenge: This week is a photo (shown on left) inspired challenge. I was inspired by the colors of pink and green...love the color of the grass in the topiary. Card Positioning System: Sketch CPS #251. Anything Goes Challenge: Anything Goes. CRAFT Challenge: Theme is Celebrations. Charisma Challenge: Happy Birthday is theme. The ABC Challenge: H is for Happy Bithday. Let's Ink It Up: Anything Goes. 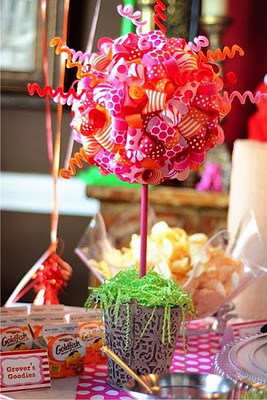 Lollipop Crafts: Use no embellishments..did not realize that I had not used any until I posted. The stamp really is the focus of this card. Stamps: Flourishes "Cherry Blossoms" and Paper Pretties "Happy Birthday"
I made this card 5.5' x5.5" which is a larger size than I usually do but I wanted to better use the pattern paper design from K&Company. I printed this image "You've Got Mail" from Digi Doodle Shop and colored with Copics. Love the old fashion Morning Glory vine and flowers by the mailbox which has a vintage used look. After cutting the design with Spellbinders Label 4, I sponged it with Antique Linen and Tea Dye distress inks to give an aged look. I placed on a small doily that I sponged the same. 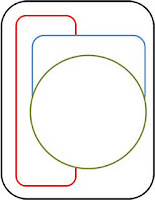 Placed this on a circle of gold CS to better show the design. Now back to this lovely pattern paper...think it has a great vintage look...I embossed it with Cuttlebug's Kassie's Brocade EF and the Border Dot from With Love EF on the outer stripes in the paper. After placing the pattern on a card base of ivory (edged with the Antique Linen ink) I popped up the image with dimensionals and added a gold seam binding bow accented with a jeweled brad and small crochet flower. The sentiment from Mark's Finest Papers "Happy Pansies" was stamped with Memento Rich Cocoa on a strip of the PP and attached. Thought this font had a vintage flavor. Sugar Creek Hollow: Do vintage, shabby chic, or primitive card with embossing. Someday, I am going to figure out how to do a primitive one. This week Digi Doodle is a sponsor. 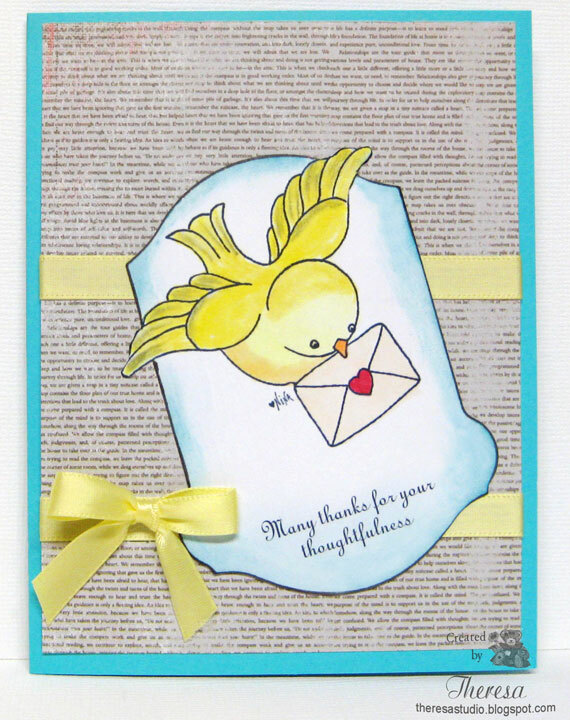 Party Time Tuesday: Use a feathered friend on your card. Digi Doodle is also one of the sponsors. 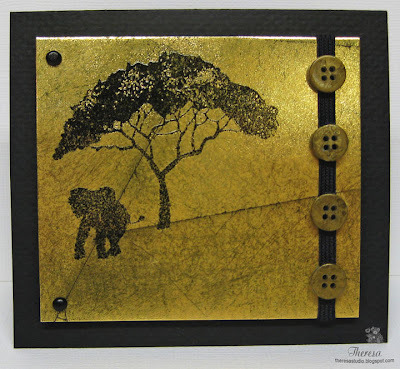 Digi Doodle Shop's Best Challenge: Use embossing. Is this what is meant by killing two birds with one stone? We have had snow the last few days and boy, is it cold outside....12 degrees as I post!! Thoughts for this card have been inspired by the weather. Birds have been busy at our feeders and that made me think of this digital image "Birdie Chit Chat" by Sassy Cheryl. This snowman is so cute and I colored it with Pencils and Markers...a switch from Copics. I cut him out with circle die and assembled the card following the sketch from the challenge at Sassy Cheryl's. Sassy Cheryl's Digi Stamps: Challenge is let it snow and a sketch on left. Tuesday Throwdown: Challenge is "Baby, it's cold outside." 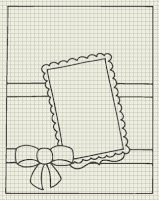 Digi Doodle Shop's Best: Challenge is embossing. Snowflakes embossed on orange CS. Fussy and Fancy Friday Challenge: Let it snow! 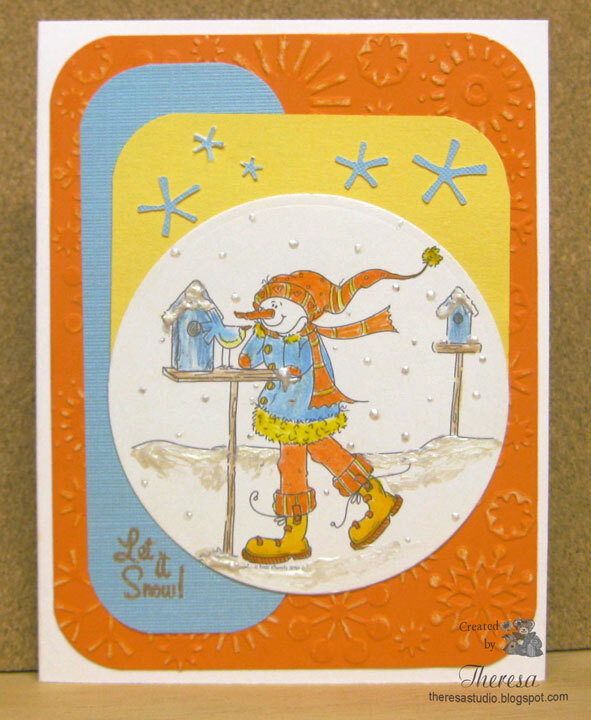 Stamps: Sassy Cheryl Digi and Flourishes "Let It Snow"
Don't forget to feed the birds. I am trying to get ahead with some challenges rather than posting just before the deadline. 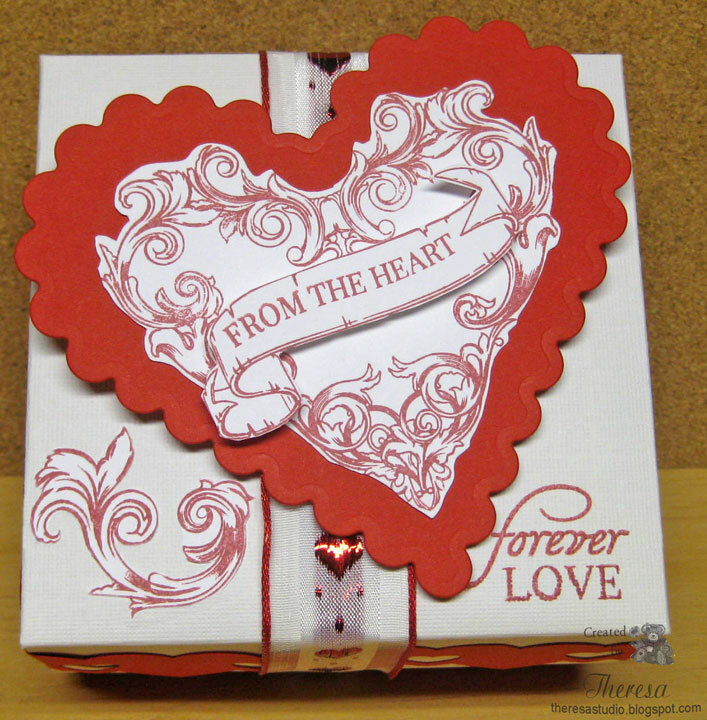 I selected Paper Cupcakes' "Sent with Love" digi and their sentiment from "Know in Your Heart" for my Thank You Card. I used a layout from the sketch by Authentique. Colored with Copics, sponged edge of image and finished with yellow ribbon. There's Magic in the Air: Challenge is "from the heart". 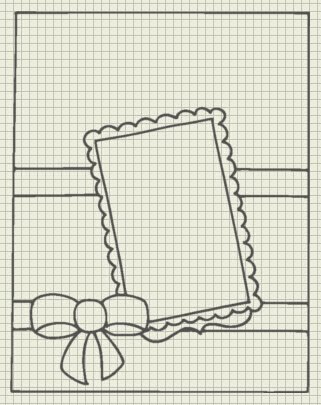 Use an image that has a heart in it and your overall card has to be some kind of thank you card or card of encouragement. Digital Tuesday Challenge: Punch it out. Used Spellbinder Die to punch out image. Party Time Tuesday: Use a feathered friend. Crafty Caz Weekly Challenge: Use someting new. Pattern Paper and sentiment are new. Authentique Paper January Sketch: See above. Used "Blissful" paper pad. 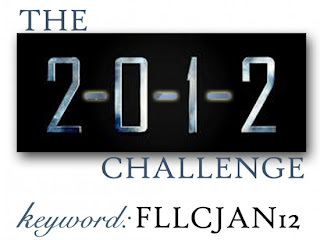 Flourishes is having a limited supply challenge that revolves around 2012! Here’s the recipe: You can only use 2 colors. You can use 0 bling. 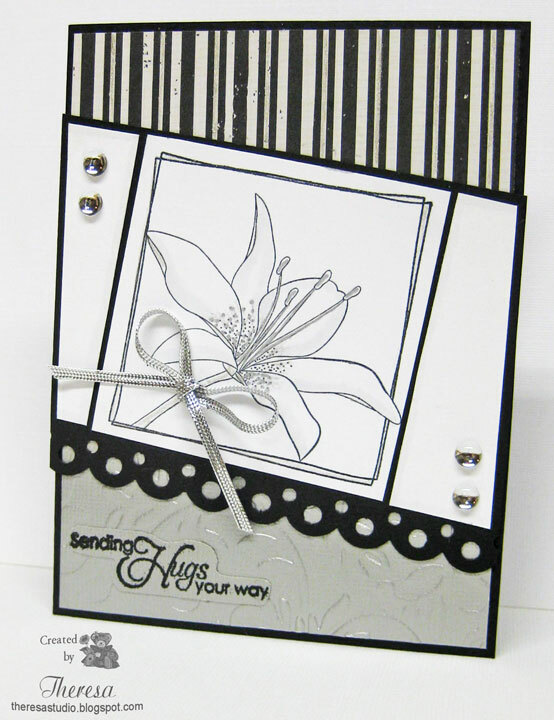 You must use at least 1 embellishment and you can only have 2 layers (not including your card base)! My colors are Red and White (guess I can use white as a color), the embellishment is ribbon (only used one and stayed with 2 layers...red mat and heart. Sounds so simple but I had to think to stay within the rules. So hard not to add some pearls or gems. The ribbon has wired edges and metallic hearts woven in in case you think that the hearts are a bling. Ribbon from stash...had this for a long time....save for special cards. The champagne was very good New Year's Eve and my DH saved the carton as he just knew that I'd find some way to use it on a card. And I did not disappoint him. 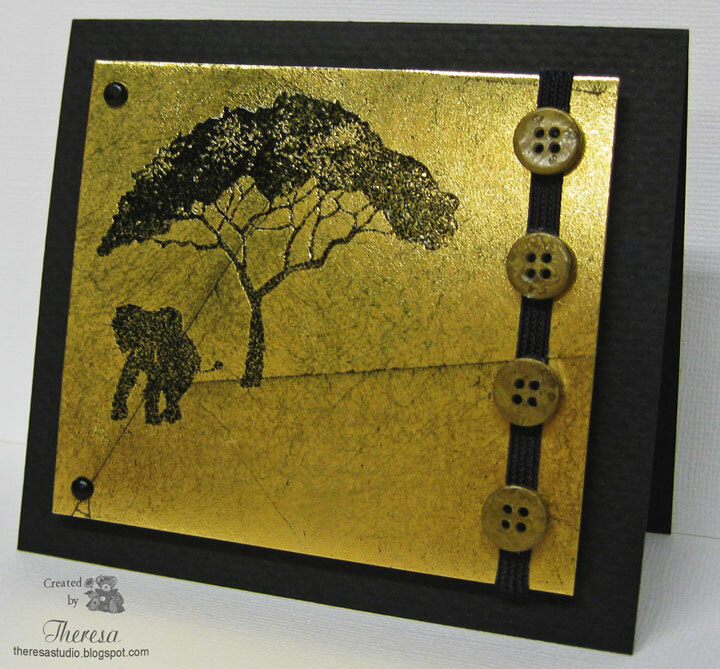 I cut a section of the box and used below for this card featuring a black silhouette. I simply stamped with Versamark and heat embossed with a Black EP on the gold box. Colored some buttons with paint, added some brads and braid and assembled all on a black CS following the sketch below. The design in the box was great for this scene. Speedy Fox and Friends Challenge: Week 89 suggested by Patty-" Use brads or eyelets". Also used Stamps from Mark's Finest Papers. Cards for Men: Theme is recycling. Used section of a box..see top of post. Anything Goes Challenge: Anything Goes. How easy! City Crafter: Back to Black Challenge is to make a card or project incorporating Any Black Silhouette image. ABC Challenge: G for Green - use recycled item. See box above. 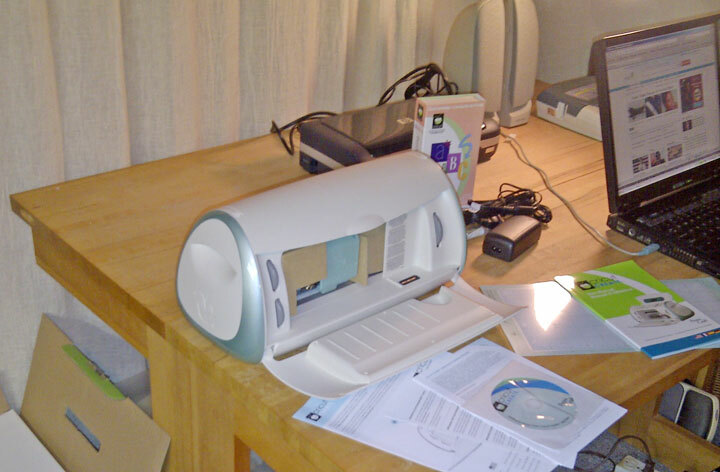 Fab 'n' Funky Challenge: Recycle it. Sharpie Paint Pen Metallic Gold for painting buttons. 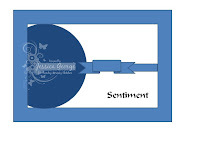 Will add sentiment or not when I use the card. I tried to make comments on all the challenge blogs but blogger did not let me. Thanks for all the inspiration from each. Tired of Blogger Problems..Have They Got You Down??? Having Blogger Problems with making and reading comments? I too have had these problems. Seems Blogger rolled out a number of improvements to Blogger recently on Jan 11th. Blogger now supports threaded commenting but it seems to have caused problems for those of us whose setting for comments is "embed below post". I changed my setting to have Comments show as "Full Page" and now I can again read the comments and do hope my readers can again comment. I am posting this so that it might work for someone else having this problem. Maybe Blogger will correct this soon. Fingers crossed. If you have other information regarding this, please let meknow, that is if you can post to me now. 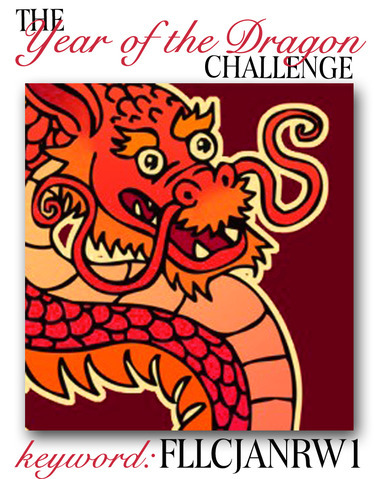 The first of Flourishes’ January Release Week Noon Time Challenges is to be inspired by the colors of this beautiful dragon with rich shades of red, orange and even pink. I decided to use this beautiful Pattern Paper from Teresa Collins' "World Traveler" pad since it has the rich colors and a somewhat Oriental scroll design. 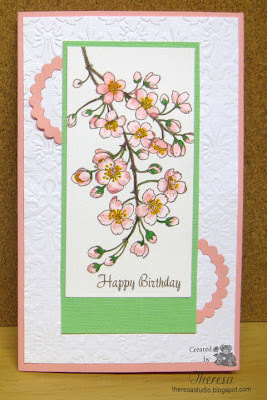 It's perfect for my card....a very simple design with the Sentiment (from Flourishes "Cherry Blossoms") as the focus. 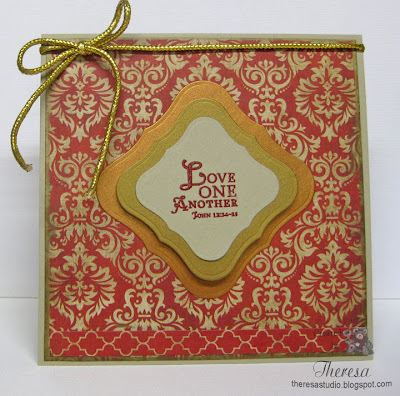 Used Nesties Label 4 to cut layers of Copper and Gold Metallic CS and topped with Sentiment on Soft Sand CS stamped in Versamark and embossed with Red EP. Attached to base card of the Soft Sand and tied with a gold rope ribbon. According to the Chinese Zodiac, the Year of 2012 is the Year of the Dragon, which begins on January 23, 2012 and ends on February 9, 2013. 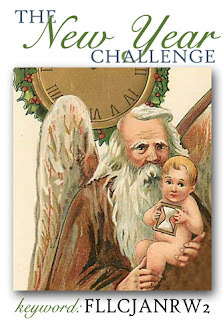 Flourishes is asking us to "ring in the new year with “Father Time” or “Baby New Year” – this challenge is a fight between new and old! 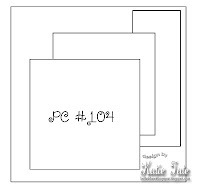 To be in the running, simply use a card that showcases an image of time or one that showcases little baby new year i.e. a baby card. Either will get you in the running. The winner will receive all three sets that are a part of our January release! " My card includes an image of time. I have used Flourishes "moments in Time" set for my entry card. The clock face is stamped with Versamark and embossed with Black EP on White Card stock. After cutting with Nesties circle die I mounted it on 2 circles of Gold Mettalic Card stock. I attached this to a mat of Red and Gold Pattern Paper from Teresa Collins' "World Traveler" mat. Love the richness of this paper. This was placed on a card base of Black Textured CS. Finished with the verse stamped on a cut out of the gold and a organdy ribbon with gold threads. Also added some gold touches to the clock with a gold brad and gold pen and around the mat with Pilot Gold Marker. (Maybe should make the sentiment a bit smaller...looks too big once I view it here?) Challenge is here. Hope every minute counts today...time is a precious thing not to waste. Welcome. 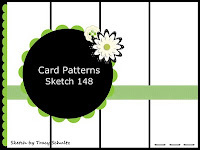 Today I have made a card for some challenges using a color combo of Black, White, and Silver, a fun sketch challenge for the layout, and a Bingo game. I used stamps from Annabelle in the "Squared Posies" set and added some of her Icicles Sprinkles. Used some light shadowing of Copics on the lily design and some Clear Star pen to highlight the designs and stripes in the DP. Annabelle Stamps Blog: Say it in Black, White, and Silver. Used silver metallic CS and ribbon.. 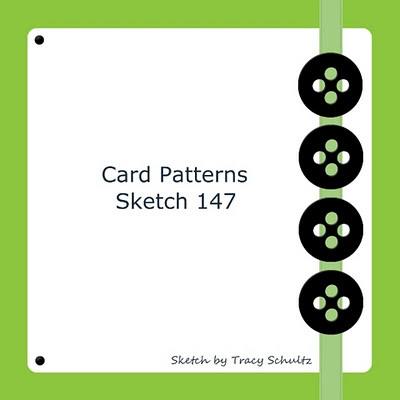 The Sweet Stop: Sketch challenge shown below. 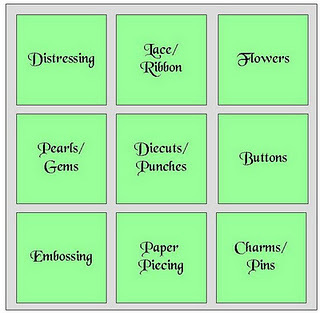 One Stop Craft Challenge: Bingo challenge to use 3 of the items in a line on the bingo card. 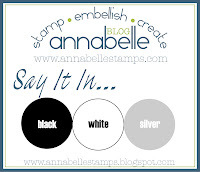 Stamps: All from Annabelle's "Squared Posies"
Papers: GKD White and Black CS, DCWV Silver Metallic CS, Echo Pattern Paper "Apothecary"
Thanks for stopping. I love to hear all your comments. 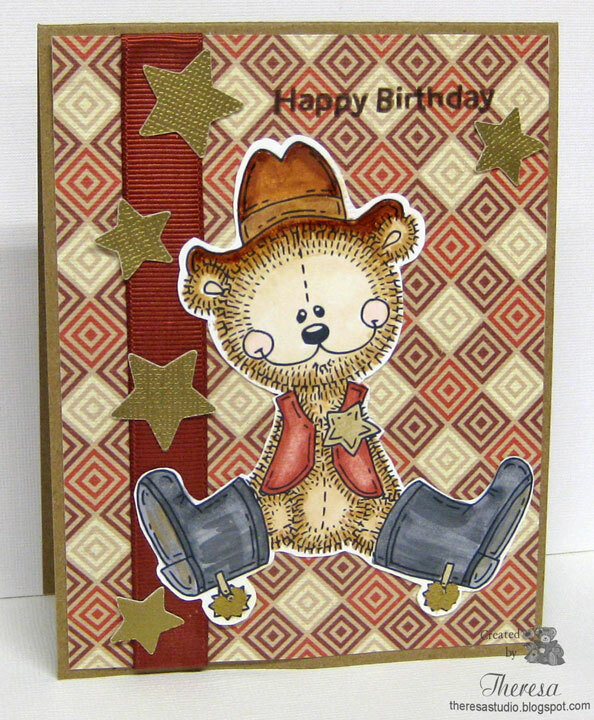 Meet the star of this card - Billy the Cowboy by Meljen's Designs. I colored him with Copics and cut him out (hate to fancy cut) to sit on the card among the stars that I cut with Cricut using Cricut Craftroom, an online connection. This is a way to use some free designs without buying cartridges or to design using your own cartridges. Meljen's Designs: Challenge is to use stars and one of her images. Cute Card Thursday: What's new? Used new paper and new stars. Fussy and Fancy: Happy Birthday or animal print. Entering a birthday card. Guess the bear could be considered an "Animal Print"? Get it? Stamps: Meljen's Digi "Billy the Cowboy"
Oh Happy Day! What's new with you today? What's new with me is playing with my new Cricut. Been cutting some hearts and decided that I should make a card with them since my DH wanted to see how I could use the cutouts. Sassy Ann at Sassy Cheryl's has a challenge this week with a theme of "New Beginnings"... new home, new baby, new anything. It's your call. I thought this challenge would be a good avenue to use those cutouts. I used Sassy's digi "Sally and Her Perfect Teddy Bear Gift" ( new digi to me) and colored her with Copics (received some new copics for Christmas that I used too). Layered with some new Pattern Paper and added the hearts and verse that I cut with new Cricut. Lot of newness here! 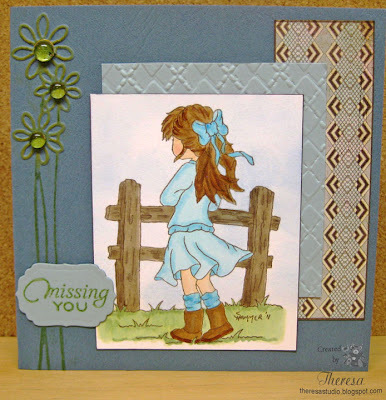 Sassy Cheryl Digi Stamps Blog: New Beginnings Edit: missed getting posted in time. 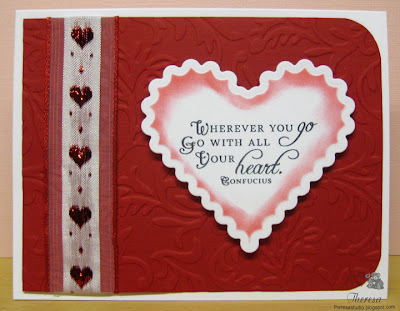 Joan's Gardens Challenge: Make a card and/or tag using some kind of hearts, use any kind of embellishments , use, pink or red with white, do some kind of embossing. Covered all of requirements. Cute Card Thursday: What's new theme. I have new paper, new digi, new copics, new Cricut used. For Fun Challenge: Something New Theme... lot of new on my card. Delightful Challenges: Have a Heart. Use hearts on project. 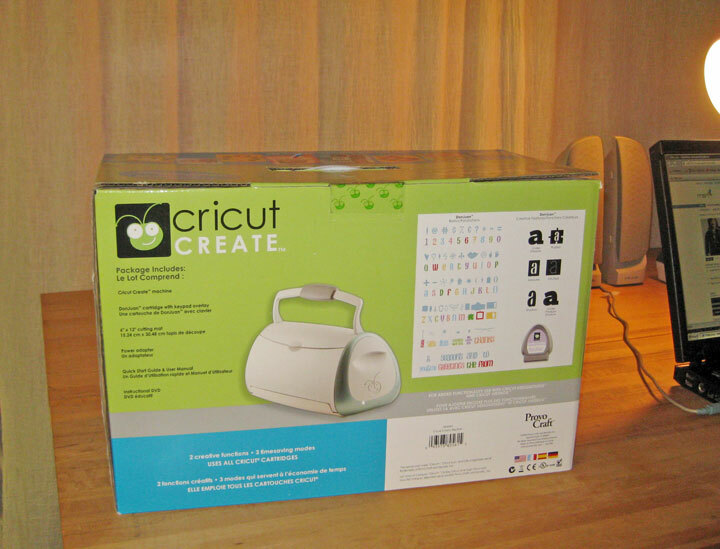 On Christmas Eve I learned from Cec that I was the winner of a Cricut machine from Sugar Creek Hollow compliments of Tracy, the owner of SCH. My name was drawn from 190 entries...lucky me!!! 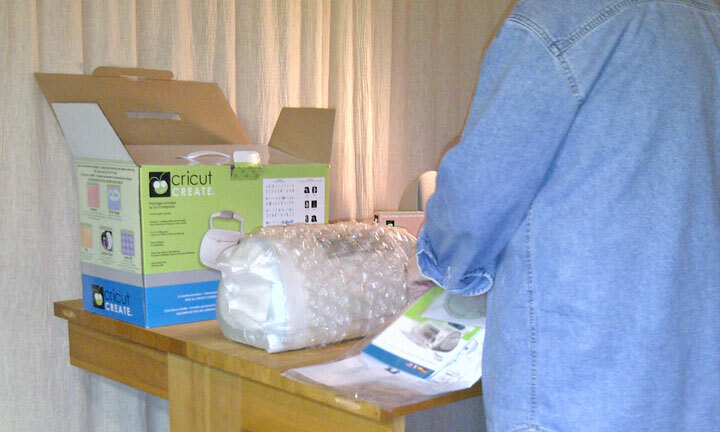 I was excited on Friday when my prize was delivered....was like having another Christmas day. I want to share some pictures of my prize. 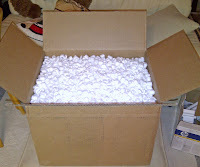 Great Packaging ---full of popcorn. 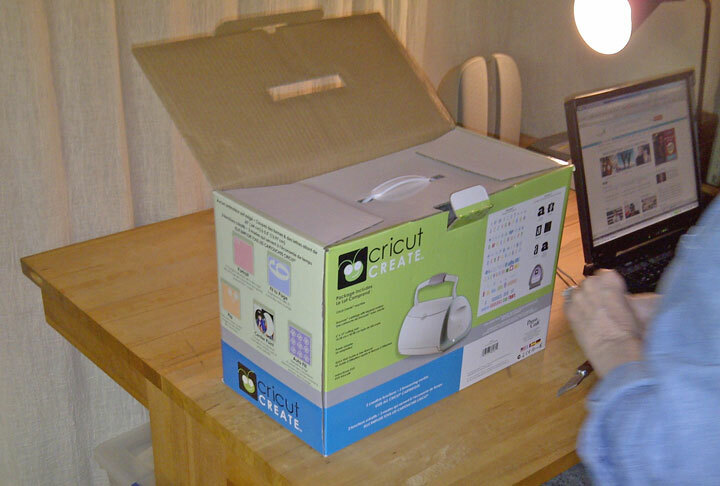 Love the size of this Cricut! Excitement builds as I open the carton. 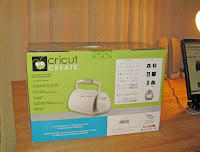 Love this Cricut... it is the Cricut Create....a great size that can easily be moved around in my studio.....now it sits next to my laptop.....now to learn to use it! ﻿ Thanks to everyone at Sugar Creek Hollow, especially Tracy for this great prize.